It's the national pastime that leaves more than 50 million people scratching their heads every week — crossword puzzles! From baseball greats to heads of state, anyone can be a "puzzle head," including Daily Show host Jon Stewart and former President Bill Clinton. "I find it very relaxing," President Clinton says. "Sometimes you have to go at a problem the way I go at a complicated crossword puzzle. You start with what you know the answer to and you just build on it." More challenging than the brainteasers themselves is how they're made. Merl Reagle has been designing puzzles by hand since he was six years old. He begins each puzzle with one word, and then fills in other words that generally correspond to a theme. Still, Merl always follows the rules: Only one-sixth of the diagram can be black squares, and the arrangement has to look the same whether you're looking at it right side up or upside down. After finishing a puzzle, Merl sends it to The New York Times crossword editor Will Shortz, who sifts through about 70 puzzles a week. Will decides which puzzle will run on which day. If it's a Monday puzzle, the clues will be easy. The clues are always the most difficult on Fridays and Saturdays, Will says. So what makes the perfect puzzle? "The perfect puzzle is one that stretches you to the limit, the one that you look at and think, 'I can't do this,' but then you do, and that's what gives you the great feeling of satisfaction," Will says. 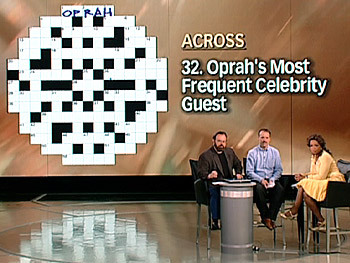 As it turns out, Oprah has a very popular name for crossword puzzlers because it starts with a vowel. "Just in the last 10 years, I think the Times crossword has used your name about 30 times," Will says. "My favorite clue that I've ever used for your name in The New York Times crossword is 'show of compassion.'" Merl and Will even designed a special scrambler just for Oprah! Built in the shape of an 'O,' most of the clues are about Oprah and all 21 years of her show. Some of the clues — like "Sophie's mom" — are easy; but as the puzzle goes on, they get more difficult. For example, who is Oprah's most frequent celebrity guest? You get five letters... And what are the two words (in three letters) that Oprah hasn't said?